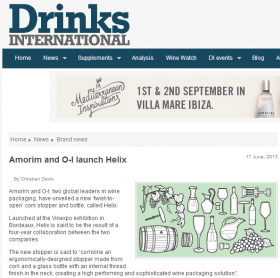 Launched at the Vinexpo exhibition in Bordeaux, Helix is said to be the result of a four-year collaboration between the two companies. The new stopper is said to “combine an ergonomically-designed stopper made from cork and a glass bottle with an internal thread finish in the neck, creating a high performing and sophisticated wine packaging solution”. Helix claims to combines all the benefits of cork and glass – quality, sustainability and premium image with user-friendly, re-sealable convenience. The companies say it can be easily implemented by wineries with only a minor adjustment to the existing filling lines. “We are delighted to offer the market not only a 100% renewable, modern product, but also a solution that enhances the wine drinking experience through opening and resealing convenience,” said Amorim. The companies claim that after extensive testing, wine packaged in Helix glass bottles with cork stoppers showed no alteration in terms of taste, aroma or colour.